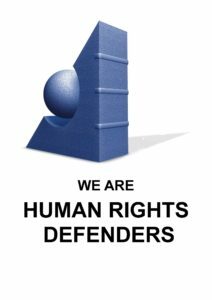 For many years, ‘Geneva for Human Rights – Global Training’ (GHR) has been training human rights defenders in international human rights, humanitarian and criminal laws, both in Geneva and in the field. Our Courses explain how to document human rights abuses and to use of UN human rights mechanisms and procedures. Our trainees prepare reports on cases of violations, and we advise them and their organisations on the best way to submit their communications to UN bodies. Since 2003, we trained many defenders from West Papua in our Geneva Courses. We also conducted courses within Papua. In the communications of our trainees and in our meetings with victims and witnesses, we have been shocked by the massive human rights violations occurring in Papua province since its integration into Indonesia in 1969. The current situation in West Papua is the result of a failed decolonisation process. The proclamation of the Indonesian Republic (1945) brought most territories of the former Dutch East Indies under Indonesian sovereignty, except for the western half of the island of New Guinea, which remained under Dutch control. The Netherlands began preparing the territory for independence, but Indonesia launched a military operation for the ‘return‘ of Papua (December 1961). The USA stepped in to broker a deal and pressed the Dutch to allow Indonesia to administer Papua while the United Nations (UN) oversaw negotiations. Indonesia was mandated to administer a UN-supervised referendum on the future of the territory, the so-called ‘Act of Free Choice‘ (1969). Instead of organising a one-man, one-vote referendum, Indonesia handpicked a council of 1,026 tribal leaders (from a population of more than 800,000), to decide on behalf of the Papuan people whether the territory would integrate with Indonesia or opt for independence. Faced with intimidation and coercion, the council returned a unanimous decision in favour of Papua’s integration with Indonesia. The legitimacy of the process was questioned by the few international observers present, human rights activists and legal experts in Indonesia and internationally. However, the UN ‘took note‘ of the process of the Act and recognized the Indonesian sovereignty. Since it integrated the Papuan territory, Indonesia launched a policy of colonisation. Population transfer, mining activities and military operations dramatically increased. Whilst the total population of the territory continued to grow, largely due to the transmigration flow from other Indonesian islands, the Papuan population decreased sharply. This poses a threat to the Papuan peoples’ existence and survival as a culture and ethnic entity. A law of the Indonesian Parliament on Special Autonomy in West Papua could have been a start for change. However, without consulting the Papuans, Indonesia decided to split the territory in two or more provinces. The use of the Papuan flag itself was prohibited. The living conditions of the indigenous Papuan peoples are in stark contrast to those of the trans-migrants from other parts of Indonesia. 11.5 % of Papuan children die before the age of five in the highlands of West Papua. The mortality rate in West Papua is about double the rate in neighbouring Papua New Guinea, and about three times the average rate in Indonesia. No country in Asia-Pacific has such a high rate. Negligence of educational facilities has meant that Papuans suffer poor standards of education. Due to reduced access to education, in remote villages, literacy rate is less than 20%. Papuans represent less than 42% of the population today, compared to an overwhelming majority in 1971 (96.09%). This situation is exacerbated by the ongoing policy of transmigration, to move people from more populated areas of Indonesia to Papua. Facing a growing number of peaceful demonstrations, Police, Mobile Brigade units, the Armed Forces, Air Force and the Navy are using excessive force. Freedoms of assembly and of opinion and expression are restricted. Over the last ten years, dozens of Papuans have been arbitrarily executed, and hundreds arbitrarily arrested, detained and tortured. The number of arrests has risen to an alarming, record-breaking high of more than 4000 Papuans detained between April and June 2016. Cases of threats, intimidations and obstruction of work of defenders and local journalists almost doubled compared to previous years. All this occurs in a climate of impunity. For almost all of these cases there has been no proper investigation, perpetrators have not been prosecuted and victims have not been provided with redress. There is also a recent trend, the Papuan youth engaging in (peaceful) demonstrations for justice and independence, leading to increased repression in the territory. Living under difficult conditions, facing large scale human rights abuses, Papuan partners have repeatedly called for international scrutiny and solidarity. However, until now the fate of the Papuans has been largely ignored by the UN bodies, in particular the Commission on Human Rights and now the Human Rights Council (‘HR-Council’). Since 2004, a few UN Special Rapporteurs reacted to cases submitted and urged the Indonesian Government to stop torture and summary executions, to investigate all the crimes committed, and to ensure Papuans access to education, health and food. Several Member States from the Pacific have also raised their concerns during the UPR review of Indonesia and recent sessions of the HR-Council. Treaty Bodies also made recommendations on Papua when considering the periodic reports of Indonesia. So far, the Indonesian authorities have reacted reluctantly to the concerns of Special Rapporteurs and treaty bodies regarding the worsening situation in Papua. Since 2007, the Indonesia accepted only the visit of three Rapporteurs to the Papuan territory, those on torture (2007), human rights defenders (2007), and right to health (April 2017). To break international silence, GHR actively participated in 2003 in the set-up of an international coalition on the promotion and protection of human rights in West Papua, the Faith-based Network on West Papua, currently called the International Coalition for Papua (ICP). GHR is a member of the ICP Board. Most of the member organisations are based in Germany, the Netherlands, the United Kingdom and Geneva. The ICP regularly issues human rights reports and advocates for peaceful improvement of the situation. The 2nd Geneva Consultation of the network (April 2004) adopted a strategy paper to influence the decision-making processes at national and international level. 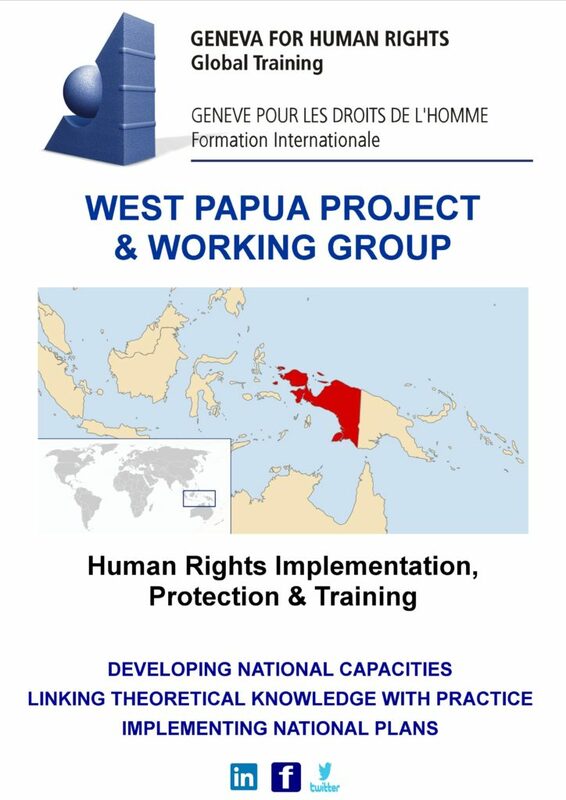 The same year, the network’s Steering Group entrusted GHR with the setting-up of a training programme to develop the capacity of Papuan partners and defenders in investigating, preparing reports on violations, using international mechanisms and procedures, and advocating in international fora. Since then, dozens of Papuan defenders have been trained in GHR Geneva Courses. GHR also conducted Courses in Papua prepared with several former Geneva trainees, such as those Training in Jayapura (6 to 13 October 2005) and in Abepura (25 to 27 August 2008). Clearly, more accurate and regular information is collected and submitted by those who have been trained. GHR regularly reviews the follow-up to its training. In 2016, a member of GHR undertook a field visit to Papua to assess the training needs of the Catholic partners there. He recommended that they focus on the use of domestic mechanisms, on strengthening the networks and improving their skills in English. GHR members also met two Papuan defenders to review the files received on the waves of massive arbitrary arrests and detention occurring in Papua and their needs in a specific training. In 2016, three defenders from Papua participated in the Geneva Course. Human rights have to be implemented by the country itself (Government and civil society). In their recommendations, UN organs and procedures contribute to strengthening the domestic protection mechanisms. At international level, States decide. Thus, there is a need to repeat the interventions to be heard. Using international procedures implies a sustained action. Member organisations of the ICP Coalition, including GHR, submitted several communications to the UN procedures. Thanks to their accuracy and quality, UN thematic special procedures increasingly reacted. The impact of the communications is even stronger when they are jointly submitted by several NGOs, and coordinated by the ICP Secretariat. ICP members also contributed to shadow reports to treaty bodies for the examination of the periodic reports of Indonesia, and to the stake holders’ reports for the UPR. They make joint oral statements at HR-Council’s sessions and hold side-events at such sessions. With this 15-year sustained effort, we won the battle against the silence. The next step is the battle for the truth. Both constitute a preliminary condition to the success of a longer struggle to obtain States to react effectively on the worsening situation in Papua. In July 2016, GHR urged the Committee on the Elimination of Racial Discrimination (CERD) to consider the deteriorating situation in Papua under its Early Warning measure. The CERD monitors the implementation of the International Convention on the Elimination of Racial Discrimination, a treaty ratified by Indonesia. It is composed of 18 independent experts elected by the States parties. The 18-pages report of GHR was prepared by our study project on implementation. It describes the main human rights violations, with Appendixes on a brief history of Papua, a demographic analysis of the Papuan population and a list of hundreds of Papuan recently arrested. The report shows that mining activities and military operations increase, that the total population grows, largely due to the transmigration flow, whilst the Papuan population decreases sharply. GHR calls for action to prevent the extinction of the Papuan population. ‘The Indonesian Government should stop the systemic discrimination against the Papuan population; stop the excessive use of force against, and extra-judicial killing of, peaceful protestors; and, halt the excessive militarisation of Papua province’. Following GHR Appeal, the CERD addressed on 3 October 2016 an ‘Early Warning’ to Indonesia regarding the situation the ‘Papuan indigenous people in West Papua’. Signed by CERD Chairperson Anastasia Crickley, the letter requests the Government ‘to submit information on all of the issues and concerns as outlined above by 14 November 2016. ‘repression by security forces during Papuan flag-raising ceremonies (…); excessive use of force and killings during peaceful demonstrations since 2013; massive arrests in May 2014 during demonstrations against extraction and plantation activities; numerous arbitrary arrests and detention since the beginning of 2016 (…); large scale impunity; State’s policy (…) favouring the migration of non-indigenous persons from other parts of Indonesia to West Papua, ‘which leads to the decline in representation of the population of Papuans in comparison to the general population in their territory’; and poor educational standards resulting in very low rates of literacy. A major political development has been the strong support of Pacific States to the Papuan people. In 2013, in his address to the UN General Assembly, Vanuatu’s Prime Minister requested a special representative to investigate the human rights situation in Papua. Since then, several States from the Pacific regularly raised the question of West Papua in sessions of the HR-Council and General Assembly. Those who spoke, jointly in the HR-Council, and individually at the Assembly, are the following States: Vanuatu, Solomon Islands, Tuvalu, Nauru, Marshall Islands and Palau. These positions in favour of West Papua enjoy a broad support among the population of the Pacific States. As a training organisation, GHR has trained diplomats from small islands and least developed countries (LDCs). Institutional memory is lacking in the UN. Information on past studies and decisions is critical for them. Moreover, the complexity of the rules of procedures increased with the creation of the HR-Council. GHR supported the creation by the UN General Assembly of a fund for training diplomats from these nations. With this experience, GHR wants to facilitate the opening in Geneva of Permanent Missions of the Pacific States. Currently only the Solomon Islands have a Mission. In June 2016, GHR President chaired a meeting convened by the Mission of the Solomon Islands to discuss the situation in West-Papua.